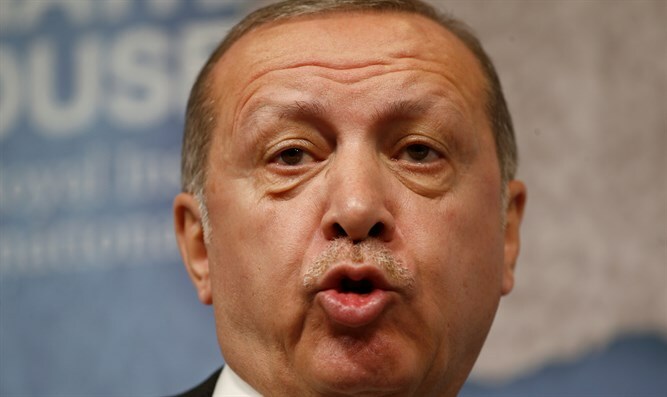 Turkish President continues his verbal attacks on Israel, accuses it of “tyranny”. Turkish President Recep Tayyip Erdogan on Wednesday continued his verbal attacks on Israel, accusing it of “tyranny” in the wake of the violent riots along the Gaza border. In comments at a dinner in Ankara, the Turkish leader lashed out at the international "silence" over the deaths of dozens of Palestinian Arabs on the Gaza border. "If the silence on Israel's tyranny continues, the world will rapidly be dragged into a chaos where banditry prevails," Erdogan said, according to AFP. Ties between Israel and Turkey deteriorated in recent days after 60 Gazans were killed during the violent “March of the Return” riots on the Israel-Gaza border. Turkey earlier in the week temporarily expelled the Israeli ambassador to Istanbul over the Gaza riots. In response, Israel temporarily expelled the Turkish consul in Jerusalem. On Wednesday, the Israeli Ambassador to Turkey, Eitan Naeh, was subjected to special security checks in Istanbul. Turkey later ordered Israel’s consul general in Istanbul, Yosef Levi Sfari, out of the country as well. In addition to the diplomatic moves, Erdogan has continued to attack Israel over the violence. However, Turkish officials, and particularly Erdogan, have continued to verbally attack and criticize Israel even after the agreement was signed.